At 0700h local time, the ship left her berth in Port of Spain to move to an offshore terminal for 'bunkering', which is ship-speak for filling up with fuel oil. Today also saw an emergency drill to practise boarding the lifeboats in case of dire emergency. Each of the two lifeboats can hold 54 people - the maximum number aboard the ship. 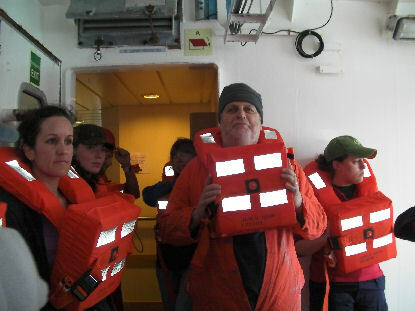 Even though there were less than half that number in each lifeboat for today's drill, it soon got very warm in there. The science team held its first meeting this afternoon, discussing plans for the first few days of operations once the ship arrives at the Cayman Trough. The plan is to map the seafloor first using the ship's multibeam sonar and the TOBI vehicle. That map should then help the planning of Autosub6000 missions to hunt for deep-sea vents.